complete the naturalization application process and take part in swearing-in ceremonies – also known as naturalization ceremonies — across the country. Naturalization ceremonies are held in virtually every county and city in the United States. These ceremonies may involve a handful of people at a local courthouse or several thousands at a sports arena. Regardless of a ceremony’s size or venue, those taking part share a common experience as they repeat the oath of citizenship, declaring their allegiance to the United States Constitution and loyalty to their adopted country. "You each bear a responsibility to assure that liberty and justice prevail for all. You now earn the right to vote, with that right, your responsibility to register to vote, and exercise that right intelligently. Read about issues of interest. Learn about who your government officials are.'' 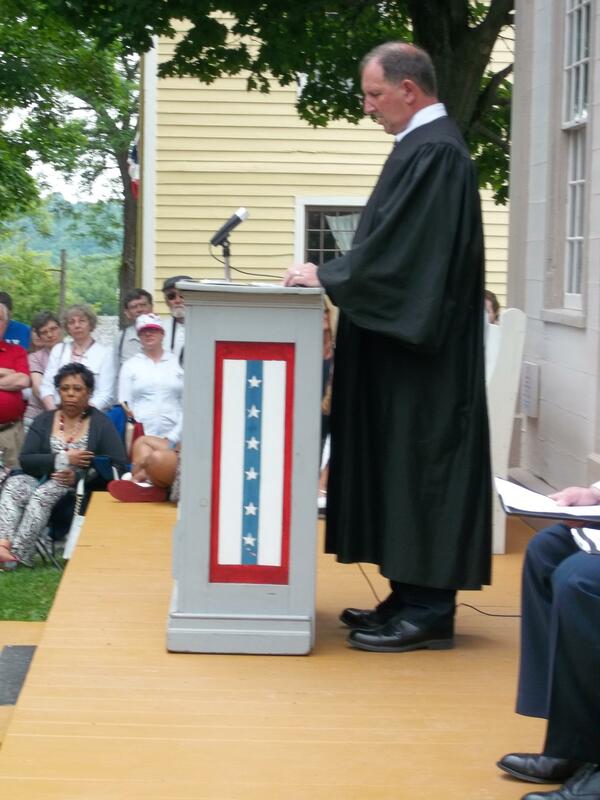 - Chief United States District Judge Frank Geraci Jr. in his remarks at the July 4 naturalization ceremony at Genesee Country Village & Museum in Mumford. LWV members were there to welcome the new citizens. Read the moving Democrat and Chronicle article about the new citizens. Naturalization is the process that confers United States citizenship upon a foreign citizen or national after he or she fulfills the requirements established by Congress in the Immigration and Nationality Act (INA), as amended throughout the years. One requirement is that a naturalization applicant must pass a test on U.S. history and government, and another test on reading, writing and speaking English. Many schools and community organizations help naturalization applicants prepare for their citizenship tests. The U.S. 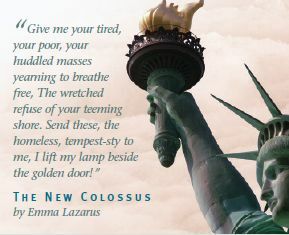 Citizenship and Immigration Services (USCIS), now located in the Department of Homeland Security (DHS), is responsible for the administration of immigration and naturalization adjudication functions and for establishing immigration services policies and priorities. The USCIS website provides a lot of information including interactive self-tests and study guides to prepare for the U.S. government and history exams. Representatives of the League of Women Voters/Rochester Metro Area attend each oath ceremony and greet new citizens. They register the citizens as new voters. League members are welcome to attend any Naturalization Ceremony. If interested, please contact Sheila Abeling at sheiler162007@gmail.com or 585.223.6819.